Intel Inc, the giant chipmaker has just unveiled a new proof of concept POS (Point of Sale) system targeted for retail markets during the NRF (National Retail Federation Convention) event held in New York recently. Some may wonder why suddenly the giant chipmaker produces such a retail product, but in actual fact it is a proof of concept platform that intends to showcase few of the advanced Intel technologies along with this platform introduction. The next generation POS, powered by Core 2 Duo processor is featured with advanced technology such as Intel vPro with AMT (Active Management Technologies) that allows remote access to control the system shut down or reboot. Besides, it is claimed to have better security features such as system diagnosis capability that eventually bring down the total maintenance cost in the long run. 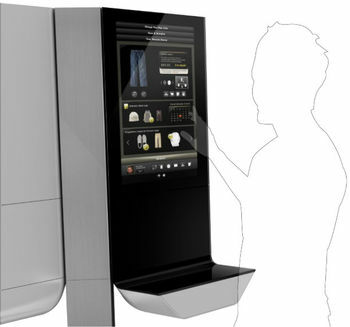 In terms of real user interfaces and experience, the POS system provides multiple touch screens with independent display capability for in store advertisement and item inventory checking while on the other hand allowing users have internet access for customer reviews, product information gathering and many more. That is not all, the POS is claimed to be easy customizable and upgradeable in case there is a plan to have next generation processor replacement to meet more stringent consumer requirement in short future.